Certain people are just shy. Some people would rather just sit quietly in the perimeter. 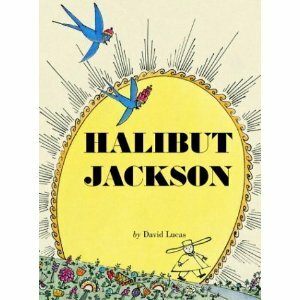 For Halibut Jackson, the reluctant titular hero of David Lucas’ book, shyness manifests in camouflage. He has crafted clothes to match any possible scenario – so he literally blends in with his surroundings…the sun, the grass, the flowers. And he’s quite content to exist in his chameleon-like world until he gets an unexpected invitation to a birthday party at the palace. Determined to disappear into the splendor of the palace walls, Halibut sews an outfit that is both ornate and bejeweled. But when Halibut Jackson arrives, the tables are quickly turned and a lesson in being unique is quickly learned. A wonderful story about overcoming the need to blend in…and the beauty of standing out.